An international team of physicists working at the Institute of Nuclear Physics at Johannes Gutenberg University Mainz (JGU) in Germany has measured the mass of a 'strange' atomic nucleus with the aid of an innovative technique that is capable of significantly greater precision than that of previous methods. 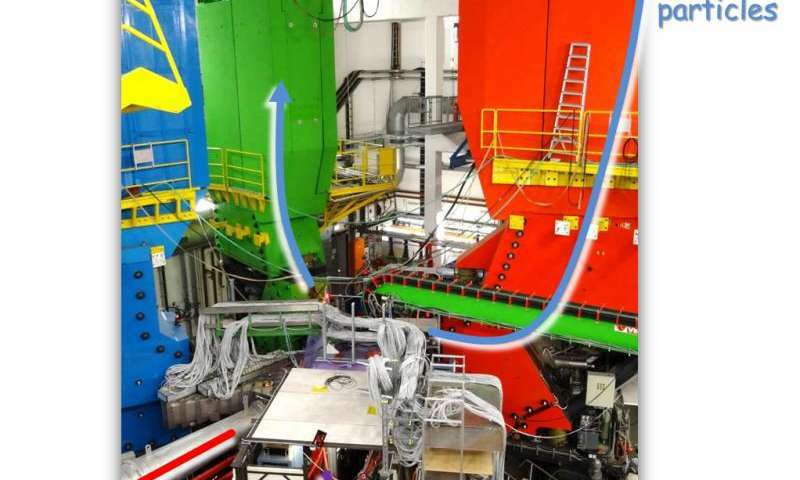 The researchers were able, for the first time worldwide, to observe the radioactive decay of artificially generated nuclei of super-heavy hydrogen at the Mainz MAMI particle accelerator using a combination of several magnetic spectrometers. They could then precisely determine the mass on the basis of accurate measurement of the decay product. The results have been published in the journal Physical Review Letters. Measurements such as this are particularly valuable when it comes to understanding the fundamental 'strong force' that holds nuclei together and is thus essentially responsible for the stability of matter. Even after decades of research, many of the details of this force are still unknown. The nuclei in matter that surrounds us consist of two building blocks, i.e., positively charged protons and electrically neutral neutrons. These interact in complex ways with and among each other. What is important is that there is a powerful attraction between these particles that binds them together to form atomic nuclei and stops them flying apart. Then the mass of an atomic nucleus is less than that of the sum of the mass of its components. According to Einstein's famous formula E = mc2, this 'missing mass' is represented by the energy of the bonds in a nucleus. This means that if the mass of a nucleus can be accurately measured, it is possible to determine the binding energy and thus draw conclusions with regard to the nature of the strong force. Other strongly interacting particles, in addition to protons and neutrons, can theoretically be bound in a nucleus as well, such as so-called hyperons that are also known as 'strange' neutrons. An atomic nucleus in which they are present is thus called a strange atomic nucleus or hypernucleus. It is possible to generate these artificially in a particle accelerator such as MAMI. Such exotic particles can exist on earth for just a fraction of a second but it is possible that there may be large numbers of them deep in the cores of neutron stars, which are also held together by the strong force. There are many, as yet, unanswered questions about these spectacular star remnants out there in deepest space: How large are neutron stars? What is in the interior of their unobservable cores? How hot and how dense is it there? Otherwise inaccessible details about the strong forces that not only hold strange nuclei but also neutron stars together can be determined by means of the study of hypernuclei and this approach can help explain the structure of minuscule atomic nuclei and gigantic neutron stars and how they are related. 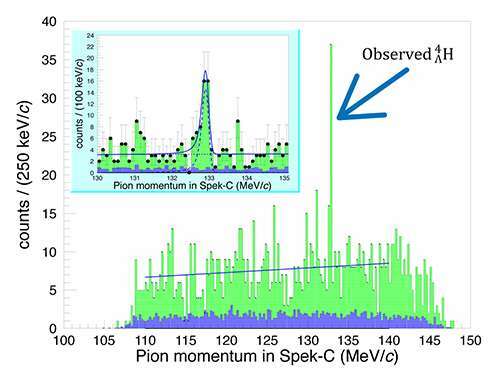 Using the Mainz Microtron, the team of researchers headed by Professor Josef Pochodzalla and Dr. Patrick Achenbach generated a very heavy form of the common element hydrogen with a nucleus comprised of one proton, two neutrons, and a hyperon. This artificially created strange atomic nucleus has a mass approximately twice that of deuterium, the heaviest stable form of natural hydrogen. In order to determine the mass of the strange hydrogen nucleus as accurately as possible, the nuclear physicists observed the radioactive decay of the nucleus using a combination of several magnetic spectrometers. In this context, these devices have a function similar to that of an electron microscope, although they actually operate on a much larger scale. They use a strong magnetic field to guide particles and bring them together at a location where they can be measured by particle detectors. In order to achieve the greatest accuracy possible, the spectrometers are nearly 15 meters across and weigh more than 200 tons. Also necessary to obtain extremely precise results are a high energy, accurate focus, and stability of the accelerated particle beam. All this is possible to achieve using MAMI. The researchers in Mainz were thus able to measure the binding energy of the hyperon in the nucleus of super-heavy hydrogen. It is roughly equivalent to the total binding energy in the nucleus of deuterium. Of particular interest to the researchers is the still unanswered question of whether this binding energy changes when the hyperon is present in an equally heavy helium nucleus instead of a hydrogen nucleus. If so, it would mean that the force of attraction exerted by the protons and neutrons on the hyperon differs in the two nuclei, thus breaking the symmetry between the components making up the nuclei. Mass, when will we get it correctly?